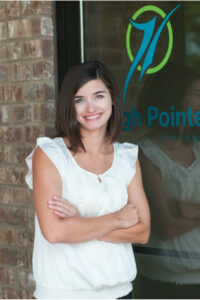 Physical Therapist ~ Courtney is a 2010 graduate of Belmont University where she earned her Doctorate of Physical Therapy. Prior to that, she attended and graduated Mississippi State University with a Bachelors degree in Clinical Exercise Physiology in 2007. Courtney originally joined the High Pointe team as part of her internship then stayed on as a technician prior to physical therapy school. She rejoined the team in August 2014 with a focus in pediatrics. Courtney is from Clarksville, TN and loves being so close to all of her family. She is married to Eric and has 3 little girls – Annabelle, Mattie Kate and Eliza…who keep her very busy! Courtney loves spending time with her husband and kids doing anything outdoors, running, and boating with her family.and cooking.